Economic growth in the Eurozone decelerated in Q1 2018. Last week’s release of the final GDP figures by Eurostat shows seasonally adjusted quarter-on-quarter (sa, q/q) real GDP growth of 0.4 % in the first quarter of 2018 after five consecutive quarters of 0.7 % quarter-on-quarter growth. Compared to the first quarter of 2017 (year-on-year), the Eurozone economy expanded by 2.5 % (y/y). Thus, economic growth in the Eurozone is lagging the United States where economic output increased by 2.8 % (y/y) in Q1 2018. Along with the final GDP figures, last week’s release gave a detailed breakdown of GDP growth. It reveals that the slowdown of growth was driven by the external sector. The contribution of net exports to year-on-year GDP growth has declined to 0.6 %-points, which is approximately half the contribution of net exports in Q4 2017 (1.3 %-age points). Both the volume of exports as well as the volume of imports declined, compared to the previous quarter. The decline of the volume of exported goods and services (-0.4 %, sa q/q), however, was more substantial than the decline of the volume of imported goods and services (-0.1 %, sa q/q). Domestic demand, on the contrary, remains robust and has even accelerated. 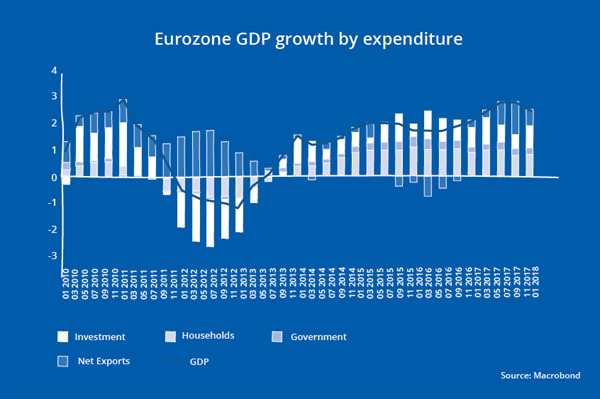 Figure 1 (see pdf) shows the contributions to Eurozone GDP growth by expenditure. It is evident that household consumption continues to be a stable driver of GDP growth. Furthermore, a built-up of inventories contributed positively to GDP growth in Q1 2018. The situation on the labor market remains bright as the unemployment rate has further declined to 8.5 %, which reflects 13.9 million people having sought for employment in April 2018. Among the largest Eurozone economies, GDP growth was subdued with the exception of the Spanish economy which kept its pace of 0.7 % quarter-on-quarter growth. Germany grew at 0.4 %, France at 0.2 % and Italy at 0.3 % (sa, q/q). The Austrian economy continues to grow at a solid pace above the Euro Area level with 0.8 % growth in Q1 2018 (sa, q/q). Spain and Austria are also those countries which saw their exports increase in the first quarter of 2018. Italian exports, on the other hand, declined by 2.1 %, German exports by 1 % and French exports by 0.3 % (sa, q/q). Decelerating export growth might be related to Eurozone’s recent deterioration of price competitiveness. Figure 2 (see pdf) shows the growth rates of real effective exchange rates (REER), which are price level adjusted developments of trade weighted bilateral nominal exchange rates. Positive growth rates of REERs indicate a loss of price competitiveness of a country with respect to its trading partners. In Q1 2018 the average REER increased by 6.7 % (y/y) in the Eurozone. During the same period the EUR appreciated to the USD by 15 % (y/y) from 1.07 EUR/USD in Q4 2017 to 1.23 EUR/USD in Q1 2018. Since March, however, the USD strengthened against the Euro such that the exchange rate effect will be less pronounced in Q2 2018 than it was during the first quarter. Despite the recent Euro weakness, the common Eurozone currency will still be approximately 6 % more expensive, in terms of USD, in Q2 2018 than it was a year ago. Also, survey indicators from the European Commission indicate a weakening perception of the Eurozone’s competitiveness outside the EU. Thus, the most recent information on the Eurozone economy indicates a slowdown in growth momentum. In light of the upcoming monetary policy meeting of the Governing Council of the ECB on the 14th of June and the release of new ECB staff macroeconomic projections, the ECB might adjust its macroeconomic view accordingly. The latest ECB macroeconomic projections from March 2018 sees Eurozone GDP growth at 2.4 % in 2018. Considering 0.4 % (q/q) GDP growth in Q1, a growth rebound to 0.6 % (q/q) would be required for the remaining quarters in order to achieve 2.4 % growth in 2018. Based on the already available information for the second quarter, our nowcasting tool does not indicate a growth rebound but rather continued growth at 0.4 % (q/q). Hence, it might well be the case that the ECB’s growth projection for 2018 will be revised to the downside by 0.1 %-age points. Besides the ECB’s view on the Eurozone’s growth outlook, the Governing Council’s perspective on inflation developments might require adaptations. HICP inflation has surprised to the upside in April with price growth at 1.9 % (y/y). The main reason for higher inflation was higher energy prices (Figure 3 - see pdf)). Higher than expected oil prices is, therefore, likely to cause an upward revision of HICP inflation. The ECB staff macroeconomic projections from March have assumed an oil price of 65 USD per barrel for 2018 while, at the moment, the oil price is at 77 USD per barrel and the end of year forward price is only moderately lower at 75.6 USD per barrel. This might raise HICP inflation for the whole year 2018 to 1.7 % from previously 1.4 %. Besides the energy component, also core inflation, excluding energy and food, has accelerated from 0.7 % in April to 1.1 % in May. This was mainly driven by higher service prices (1.6 %, y/y). However, core inflation decreased in April why the higher core inflation rate in May should more be seen in line with a medium term trend, which is rather constant at 1.0 % (3 months moving average). Hence, it would be too early to interpret the latest surge in core inflation (May) as evidence of convincing signs of a sustained upward trend. Thus, the 2018 ECB macroeconomic projection from March for HICP excluding energy and food of 1.1 % remains in line within the current macroeconomic environment. This week’s ECB meeting will be of particular importance as the Governing Council will discuss the future pace of its net asset purchases, also known as quantitative easing. So far, the ECB’s communication states that the “net asset purchases, at the current monthly pace of €30 billion, are intended to run until the end of September 2018, or beyond, if necessary, and in any case until the Governing Council sees a sustained adjustment in the path of inflation consistent with its inflation aim”. Praet commented on the structural (secular or long-term) trends of interest rates and addressed why interest rates had been low in a first place at the onset of the financial crisis. Nominal long-term interest rates are disentangled into three constituent parts: 1. Expected average inflation, 2. expected average real rates and 3. real term premia, representing compensation investors require for holding onto a long-term asset. All components had had a decades-long history of consistent decline. Inflation expectations had been declining since the 1980s and stabilized at levels around 2 % in the late 1990s, while in mid-2014, these benign developments were overshadowed by a decline in long-term inflation expectations. Investors’ expectations (forward inflation swaps) declined by more than expectations among forecasters (ECB Survey of Professional Forecasters) which appear relatively well “anchored” (Figure 4 - see pdf). Real term premia significantly declined mainly on account of the imbalance between the reduced supply of, and the increased demand for, safe assets at the global level and exacerbated by the global financial crisis. In addition, it should be noted that the ECBs net asset purchases contributed to this decline in recent years. The average real rate declined over the longer-run due to structural forces. Structural factors include the slowdown in productivity, unfavorable demographic developments and the increase in savings. These factors drive investment, which in turn determines the demand for loanable funds. Productivity and population growth, which are also the drivers of potential GDP growth, have been declining for decades. The intersection point of the desired demand for “loanable funds” with the level of savings constitutes the (real) interest rate. In addition to the secular factors, there were cyclical forces that dragged real interest rates (debt overhang, balance sheet recession, tightening credit conditions, etc.). This means, that the real equilibrium interest rate – defined as the value of the short-term interest rate consistent with the economy operating at its potential (or sustainable) level and inflation at its objective – has declined. The benchmark model for the equilibrium rate of interest was introduced in the economic literature by Laubach and Williams (2003, LW) and updated by Holsten, Laubach und Williams (2017, HLW). The estimate is shown in Figure 5 (see pdf) for the Euro Area and depicts the long-term decline that was mentioned by Mr. Praet in his speech. Given that the conventional policy instrument, the main refinancing rate, had hit the zero-lower-bound (ZLB), the response of the European Central Bank in unconventional monetary policy instruments is well known and included the negative interest rate policy (NIRP) since 2014, credit easing (covered bond and asset backed securities purchases), the asset purchase programmes (“QE”) and forward guidance. Total holdings under the ECB’s asset purchase programme (APP) reached 2,431.4 bn EUR in May (Figure 6 - see pdf). This includes holdings of 1,992.9 bn EUR under the public sector purchase programme (PSPP), 254.3 bn EUR under the covered bond purchase programme (CBP), 156.8 bn EUR under the corporate sector purchase programme (CSPP) and 27.4 bn EUR under the asset-backed securities purchase programme (ABSPP). Net monthly asset purchases were 30 bn EUR since January after the monthly purchases had been reduced from 60 bn EUR per month. Net purchases on average amounted to 22.3 bn EUR under the PSPP, 2.8 bn EUR under the CBPP, 5.1 bn EUR under the CSPP and 0.5 bn EUR under the ABSPP per month since January 2018 (Figure 7 - see pdf).